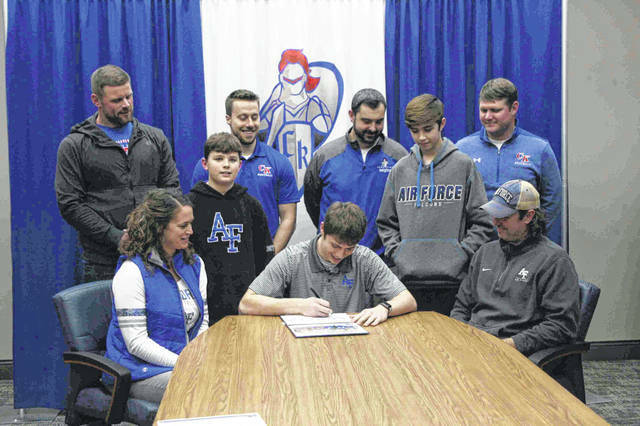 CONVOY – Crestview’s Wade Sheets has developed into a standout and leader on the football field and on the basketball court and now the Knight senior will try to hone those leadership skills and continue his football career at the Division I level after signing his letter of intent to play for the Air Force Academy Wednesday. “Definitely my leadership and I think that is what the Air Force Academy could do for me,” said Sheets, when asked what he can still work on at the next level and why he chose the armed forces campus.. Sheets has already proven himself a tremendous leader at hoops and football at the high school level. As a four-year letter winner on both offense and defense, Sheets has caught 124 reception for 2,205 yards and 25 touchdowns, a school record. As a return specialist he had 1,397 return yards with three punt returns and one kick off return for six points. Sheets holds the record for interceptions in a season with 11. He was a first-team, All-Northwest first team selection on offense and defense in 2017 and 2018 and All-Ohio special mention defensive back last season and an honorable mention defensive back selection in 2017. Crestview’s head coach Jared Owens, who taught Sheets in middle school and was his coach throughout his career on the gridiron, this was a well earned spot for Sheets. Owen added he was proud of his choice and his decision. Sheets said he was recruited as a wide receiver but has also heard he might play safety but the Knight senior added will adjust where ever they decide to play him. The Air Force Academy contacted Sheets last summer and the Knight standout said was impressed with what the the school had to offer. He made two trips out to Colorado Springs and even though he received several more offers he decided to go with the Air Force Academy. In his visits, Sheets, who had not decided on a course of study, said he as gotten to know some of his future teammates and coaches. But Sheets still has some unfinished business. Like football Sheets, a captain on the basketball team, is looking to help the Knights to an Northwest Conference and a possible long tournament run. The Knights are 15-1 and ranked No. 2 in the Division IV high school poll. Last year, Crestview was ousted in the regionals by Pandora-Gilboa last year. “We have really came along and got to big wins the last couple of weeks and we are starting to roll and everyone is feeling it and it is a pretty good time now,” Sheets said. Sheets added that balancing his athletics with his academics at the high school level will be beneficial when he hits the rigors on higher education.